Much has been made in the mainstream media regarding the increasing leverage of the average U.S. household. Indeed, in aggregate terms, the numbers can seem overwhelming, often times mind- boggling. 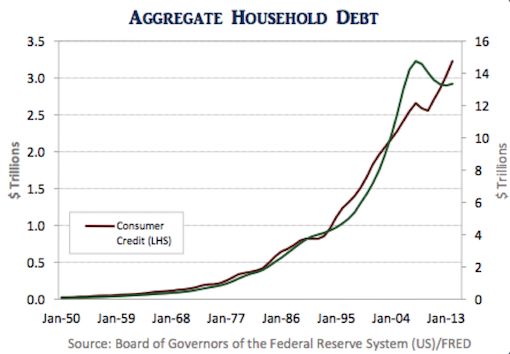 At the end of 2014, consumer credit (including both revolving and non-revolving debt) had ballooned to over $3.2 Trillion and mortgage debt exceeded $13.3 Trillion. The amount of outstanding household debt rivals that of the U.S. government and U.S. annual GDP. The exponential increase can be seen in the graph below. But what does it really mean? Is the U.S. consumer, the largest driver of both U.S. and global growth, on the precipice of a serious deleveraging cycle that will drag down asset prices across the globe? While the numbers are startling, by many measures, U.S. households are actually healthier and less leveraged than they have been for quite some time. Let’s first address the growth in Consumer Credit. It is no mystery that the U.S. consumer loves its credit cards (revolving), its cars (non-revolving) and has had a strong predisposition to finance their education (non-revolving). Relative to disposable income, the percentage of consumer debt has been climbing consistently over the last thirty years. 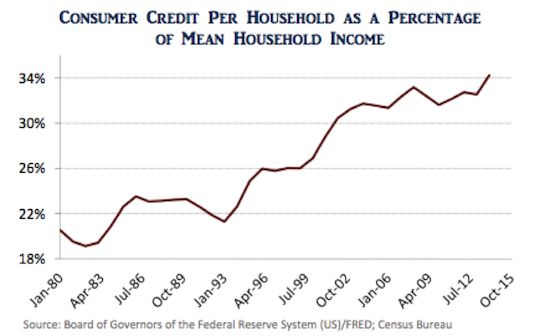 In 1980, consumer credit was only about 20.5% of the average household income. By the end of 2014, it accounted for 34.2% of household income. So, not only are consumers spending more, they are financing a larger portion of their consumption, and they are doing so at a much faster rate than their incomes are growing. Some contend that this is the result of a growing appetite for the U.S. consumer to spend—an insatiable need for consumers to have the newest toys, the most expensive clothes, and anything and everything that creates an aura of status and success. And while this argument may have some merit, the simplest economic reason for this willingness to finance their lifestyle, is that the cost of financing has continued to fall. 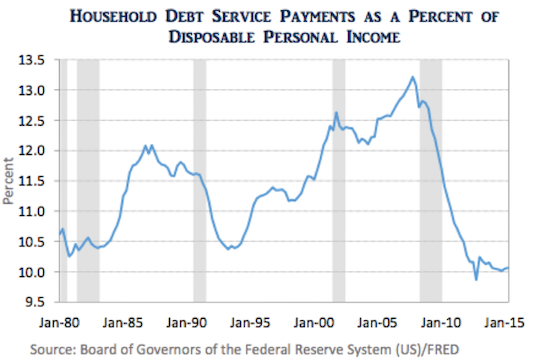 In fact, household debt service payments as a percentage of disposable income has fallen to the lowest level since the Federal Reserve started tracking the data. In the first quarter of 2015, the percentage was 10.1%, well below the 34-year average and the pre-recession high of 13.1%. Not only does this statistic paint a much different picture in terms of consumer leverage, but it gives insight into the mindset of U.S. consumers. People generally don’t concern themselves with their overall balance sheet, but rather their income and cash flow statements. The consumer is much more focused on balancing their annual budget, than worrying about their outstanding debt. Given the falling interest rate environment that they have experienced over the last three decades, they have been able to take on more debt, and servicing that debt has become increasingly easy. Of course, this begs the question, “what happens if interest rates rise?” On the surface, it makes sense that the consumer, in a higher interest rate environment, would deleverage. And at the margin, this is probably correct. However, current household debt is over 80% mortgages, and the bulk of those loans are fixed rate. Moreover, consumer credit is mostly fixed rate financing as well. Non-revolving loans make up over 74% of consumer credit as of August 2015. And while higher rates will likely increase the debt service of credit cards, and curtail new auto loans, the U.S. consumer has for the most part, locked-in low financing rates, and will continue to benefit from this for years, if not decades to come. Interestingly, despite the cash flow focus of U.S. households, their overall balance sheets are stronger than they have been since the mid-1980’s. Aggregate household debt as a percentage of total net worth was only 20.3% at the end of 2014. It has fallen from a pre-recession peak of 30.3%. There are many factors that have contributed to this decline, most notable the rebound of the U.S. housing and stock markets, but post recessionary trends also point to higher savings rates, deleveraging and an inability to access credit due to the stringent regulatory rules imposed on banks. 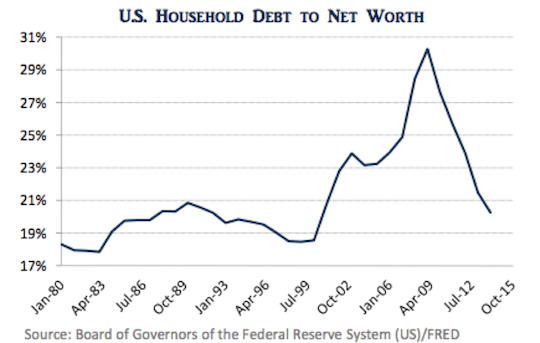 Household Net Worth has ballooned to over $85.7 Trillion in the second quarter of 2015 dwarfing aggregate debt outstanding. And while net-worth can be a volatile data series often held captive to the ups-and-downs of the stock and real estate markets, by this measure, the U.S. consumer can hardly be classified as overly-leveraged. The consumer accounts for over two-thirds of the U.S. economy, and so the financial health of this group should not be taken lightly. The Great Recession has no doubt had an effect on spending habits, and the U.S. consumer has deleveraged substantially. Their balance sheet is strong, and their debt service ratio is even stronger. Moreover, this is likely to continue. Surprisingly, the U.S. consumer has been able to achieve this in an environment where personal income growth has remained stagnant. Should the U.S. consumer choose to tap into this financial strength, or experience income growth, U.S. GDP growth will likely feel the positive effects.